"Four stoves are necessary for the safe conduct of a family through each year. A gasoline stove for cooking in summer and a cook stove for winter. A wood heating stove for fall and spring and a coal stove for winter. The neighbors’ stoves are brought up for comparison, and the beauty and utility of Mrs. Smith’s is compared with that of Mrs. Jones’s. The wife takes occasion next day to “look around” among the stove stores, and after being shown the assortment in three or four of them, becomes so bewildered in styles and prices, and where she saw this one, or that one, she can’t tell. The daughter takes a look, and comes home with her mind made up as to just the one she would buy. Some evening, a few days later, the old gentleman [husband] takes the matter in hand, and is going to have an end of this foolishness. Before he reaches home he has ordered a stove, which proves to be just the one his wife and daughter “would not have under any consideration” when they were looking. The rumpus ensuing is a stayer; in fact, it causes unpleasantness in the family until it is worn out. The science displayed by the salesman in working the old familiar thing on the husband—the stove that has been on his floor for more than a year—is a standing joke in the store for a long time. A most unpleasant feature of the stove trade over a large section of our beautiful country is the prominent part “secondhand stoves" play in closing a bargain for a new stove. Horse trading is not to be compared to it. Broken down, foundered, spavined stoves are brought to view, just as good as the day they bought them, splendid heaters or cooks, as the case may be, and the only reason they want to trade is because it is too large or two small, too high to put coal in, or it takes up too much room in the kitchen. But trade we have to, or some one else will, and make the sale of the new stove. And so the merchant’s profits on his new stove, or, perhaps, more than the profits, go in the second-hand store. A lease is generally taken for the balance of the payment, the money to be paid in installments, making the final payment due in about six months. Oh! the familiar things are pleasant to deal in. Sometimes we think there is a tendency toward less nickel in buyers’ minds, and yet, however strongly they object to a fancy stove, the appointments of this class of goods are usually so much better than the plainer that they choose the nickeled ones. Second-hand cook stoves are generally in demand, being fewer of them on the market. 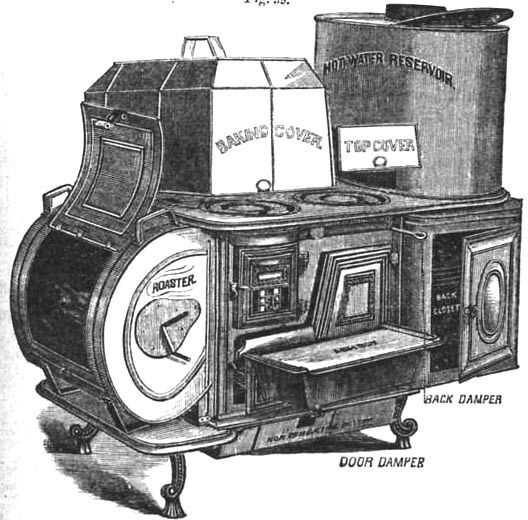 A cook stove is good until it is worn out, as styles change less, and even with more nickel on an swell doors, kickers and pie-removers, the old cook stove remains in the kitchen, and is not intended for show. A cook stove that is a “good baker" is so highly prized it is used until the last minute. The fall trade on heaters bids to be light, especially in hardcoal base-burners. The high-priced coal is almost prohibitory for the $1.25 or $1.50 a day laborer; $7.50 and $8 coal is beyond their reach. Wood they can buy by the load as their needs be without feeling it so much. Wood stoves of small size and little money are in demand, just to use until coal comes down, which each winter they hope it will do, before the next season. How little idea we have of the grinding poverty of the day laborer, the man that depends upon muscle instead of brain for a livelihood. Accident or sickness incurs a debt that takes months to pay, and many waste the best years of their lives in trying to make both ends meet. Yet this class of people are the real consumers, the ones the country depends upon to use its products. There is a growing demand among the thinking class for burners that will successfully use oil for fuel, both for cooking and heating. A number of this class of inventions have been at upon the market, but have not filled the place. Some are too expensive or complicated; they are not economical in fuel; they clog up or have to be run in connection with a steam jet. The matter is interesting many minds, and before long some one will make a fortune who gets the right thing for this purpose. The fact of smaller bills of stoves on first orders, and a more frequent ordering as stocks or assortments become broken, seems to be the order of the day. While stove men try to look at it in a favorable light, it is an open secret they are disappointed. There seems to have been a hope of an increase over last year’s business, which, so far, has not been realized. While we hear of large crops through the press, there are few sections West, North or South that are not short on some staple. Where there is abundance of everything, old debts are making the farmers feel poor. There is, no doubt, a change taking place in the manner of doing business, which is wholly the outcome of the necessity of the times. One favorable feature in this perceptible change is a gradual nearing to cash. The stove manufacturers, with large profits, years ago could afford to give long time [financing]. The merchant on this long time could afford to sell stoves on leases or monthly payments, until now a cash customer for a stove is a rarity. The stove makers have talked the matter of shortening the time on stoves, but in some way do not see their way clear to do it A shortening of time from first hands would necessitate a corresponding curtailing of liberality on the part of the retailer, which, no doubt, would reduce the number of stoves retailed. The laboring class who break up stoves in moving and buy new ones, or another class who are higher in the dollars and cents and trade off a good stove for one of newer style, are not able to pay cash for a stove. What the reduction in stove sales would be if every one kept their stove as long as it was serviceable, instead of trading it off simply on account of style, will probably never be determined. There is no doubt but the change in patterns of stoves, especially heating stoves, during the last three or four years, has acted like a tonic to the retail trade. To keep up with the styles of stoves, and have one as good and elaborate as the neighbor, has stimulated the trade, and now, like a sick person, the trade has had a relapse because the tonic is no longer taken, or, if taken, is losing its effect. Why do you trade in second-hand stoves? Because if you do not offer the same inducements as your competitors you will be badly left. They will do such business, and you must.